Vietnamese doctors are carrying out the first robotically assisted brain surgery on February 15. 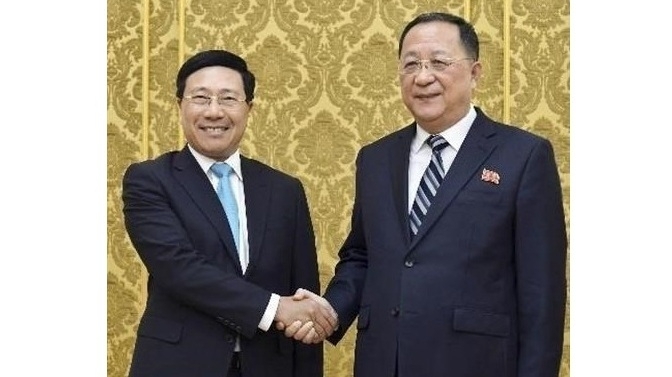 Deputy Prime Minister and Foreign Minister Pham Binh Minh paid an official visit to the Democratic People’s Republic of Korea (DPRK) at the invitation of his DPRK counterpart Ri Yong Ho from February 12-14. During his stay, the Deputy PM with DPRK Foreign Minister Ri Yong Ho and Ri Su Yong, Vice Chairman of the Central Committee of the Workers’ Party and head of its International Department. He also visited the Vietnamese Embassy in the DPRK. Lieut. Colonel Nguyen Kim Tinh, from the Vietnam Department of Peacekeeping Operations, was assigned to replace Major Do Thi Hang Nga, who has returned home after finishing her one-year working term as a commanding officer in South Sudan. In October 2018, Vietnam’s first level-2 field hospital, the first-ever independent unit of Vietnam to join the UN peacekeeping mission, deployed two groups of 63 personnel to South Sudan. The first group with 32 members set off on October 1 and the second group with 31 doctors left for the African country on October 15. Aquatic sector aims at US$10 billion in export revenue in 2019. 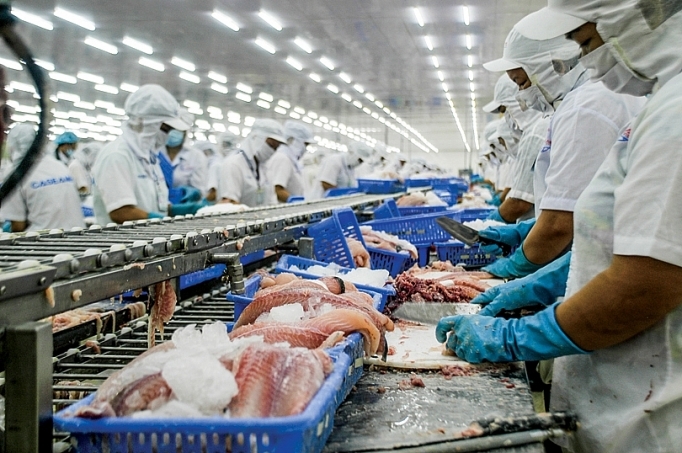 The Vietnamese aquatic industry is expected to raise its total export revenue to US$10 billion in 2019, a year-on-year increase of 10-12%. Accordingly, the sector aims to earn US$4.2 billion from shrimp exports, US$2.3 billion from tra fish exports and US$3.5 billion from seafood exports. The Ho Chi Minh City-based Nhan Dan (People's) 115 Hospital has carried out the first neurological and skull surgery with the Modus V Synaptive robot system. The first robotically assisted brain surgery was performed by Doctor Chu Tan Si, Head of the hospital’s Neurology Department, and his colleagues with the support of Prof. Amin Kassam - Vice President of Aurora Health Care (USA). The patient was a female Tay Ninh native who was diagnosed with a brain tumour in the parietal bone area, measuring 2cm and about 1.5-2cm from the cortex, which controls movement functions. The Vietnamese delegation at the International Talent Mathematics Contest in Thailand. 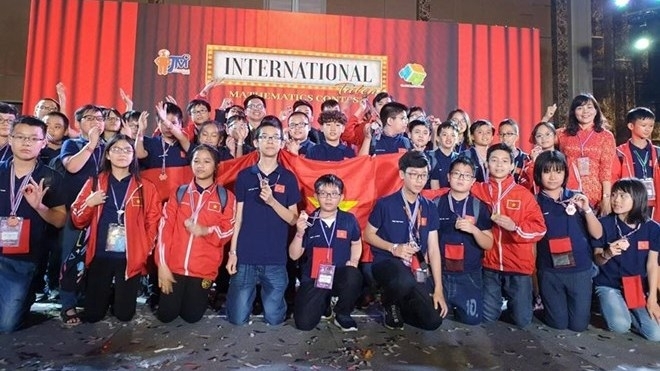 Vietnamese students won two gold medals at the International Talent Mathematics Contest (ITMC) in Thailand from February 7 to 11. Vietnam’s team comprised of 60 elementary, secondary and high school students from Hanoi. The students brought home a total 40 medals at the competition, including 15 silver and 23 bronze medals. A wide variety of spring festivals were held in numerous localities around the country, attracting a large number of locals and visitors. At the festivals, folk rituals, performances and games were reproduces, contributing to preserving and promoting traditional values. Vietnam’s U22 football team defeated the Philippines 2-1 in their Group A match of the ASEAN Football Federation (AFF) U22 Youth Championship which took place in Cambodia. The goals were conducted by Danh Trung and Minh Binh at the 74th and 78th minutes, helping Vietnam gain three points to temporary rank first in the group.